Where would Peter have sat at the Last Supper? Dr. Reagan: Where would poor Peter be sitting at the Last Supper if not at the most honored seats? Dr. Fleming: There are three evidences that would have led the first hearers to imagine Peter reclined at the lowest place at the table. Sitting in the lowest spot doesn't sound like Peter, does it? After all, Peter is as we find him in Mark's gospel first out of the boat, first to sink, first to confess, first to deny, and first to guess when he doesn't know the right answer. Remember the Lord said, "I want you to forgive one another." I always pictured Peter going, "How many times Lord, seven?" Jesus answered, "No, seventy times seven." So, Peter tended to be the first to volunteer and the most vocal of the Apostles. 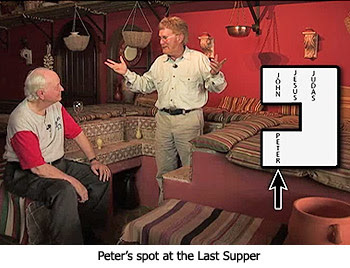 Three evidences people would have us picture Peter sitting at the lowest place during the Last Supper. Number one is the weakest evidence, and so we'll just call it "Peter's Personality." If Peter and John schlepped everything upstairs and got the room ready, it's probably alright with Peter for Jesus to give the right hand seat to John. After all, John helped. But, for Jesus to give the guest of honor seat to the treasurer, remember Judas kept the purse, well nobody likes the treasurer. By the way, Judas might have been the only Judean as Judas Iscariot means "Judas, the man of Kerioth." Kerioth is a village south of Hebron in Judea. Remember after Judas' tragic suicide, the Ascension story addressing the eleven? "Men of Galilee, why do you stand gazing up in the clouds?" So, the eleven may have all been Galilean's and Judas probably was the only Judean. For Jesus to give the guest of honor seat to Judas probably seemed like bad judgment to Peter. I can picture Peter whining, "Well, I didn't get an important seat" and then stomping around "stomp, stomp, stomp, stomp" and plops down. That'd be very human of Peter. After all, we find earlier particularly in Mark's gospel, Peter seems to only open his mouth to exchange feet, right? He's always saying and doing the wrong thing at the wrong time. There are three stronger evidences. So, the second evidence occurs when it is time to wash the feet. Everybody knows that the lowest placed person at the table was the one who was supposed to wash the guests' feet. In fact, we find a basin on many archaeological digs near the lowest place at the table. If Peter had already schlepped everything upstairs and did all this preparation work, he is certainly not about to do more. So, when it's time for the foot washing, nobody moves. The other guys aren't feeling so bad because they're not positioned in the place at the table that has to do it. They were probably thinking, "Oh, Peter's there, it will do him some good." Normally a good teacher tries three things when your students are not catching on. Number one, you might just wait a while before asking, "Has anyone learned what it's about being a servant?" Nobody moves. Two, you might give a hint. Remember at the Last Supper we have Jesus saying, "I don't want you to lord it over one another like the pagan Gentiles do." Still, no one moves. And third, of course, you set the example yourself. The third evidence that Peter was sitting at the lowest and last position on the right can be discerned from when Jesus said, "One of you will betray me." Everyone asked modestly, "Is it I?" In fact, that's what's great in Da Vinci's painting "The Last Supper," for he is depicting Jesus saying, "One of you will betray me." Most art until that time showed the moment of the consecration of the bread and the fruit of the vine. But, with Da Vinci, everyone's face is asking, "Is it I? Could I do that?" In John's gospel Peter asks, "It's not me, is it?" Peter's sure it's not him, but remember, he was dying of curiosity to know which of these other guys it was who was going to speak against Jesus. It says he motioned to the beloved disciple to ask Jesus who it was. Now, because of John sitting in the first position on the left, do you see John would be looking away from everyone on his left elbow? It would therefore be hard for any of these people to catch John's attention. But, from the opposite seat at the far right, it wouldn't have been so hard for John to see Peter. He therefore had to be in a place he could catch the beloved disciple's eye. When it comes to the time to wash the feet, here's the most important point. You are always supposed to wash them a certain way. Jesus took the towel and basin and started washing the feet. Partway through, Jesus asks, "Who is greater, the one who washes the feet, or the one whose feet are being washed?" The Apostles reply, "The one whose feet are being washed." And Jesus said, "Yet, here am I washing your feet." 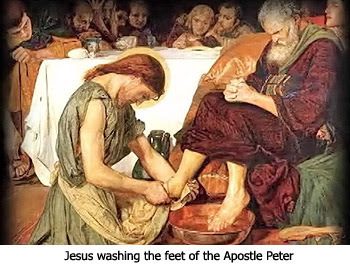 The fourth and strongest evidence that Peter was sitting in the last position is when Jesus finally got to Simon Peter, you can imagine how bad he would have felt by then seeing His master wash all the other guy's feet before him. Peter is the only one who refused to let Jesus wash his feet. This would have led First Century hearers of the text, knowing there is a place assigned to washing feet, to imagine Peter was probably the only one in the place actually assigned to wash their feet. Remember how Peter actually says, "He cries out, 'Lord I refuse to let you wash my feet.' 'But Simon your feet are dirty.'" Great conversation! "'I feel so bad, give me a bath.' 'What has been bathed only needs their feet washed.'" This interchange would have contributed to people picturing Peter positioned probably at the lowest end of the table. It's nice, isn't it, that we can picture how people would have sat in the First Century? In light of the culture, we have four descriptions from First Century sources about the seating around such a table. The seating is something that we archaeologists feel confident about. 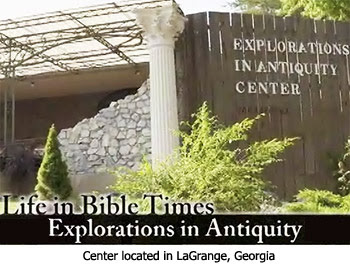 In the thirteenth part of this series with archaeologist Dr. James Fleming at his Explorations in Antiquity Center, we'll glean some biblical insights by learning the Passover meaning in the Last Supper.